Watch above video of an interior project including items of this collection! Get inspired by our selection of pictures of ancient Egyptian furniture and interiors on Pinterest. Exotic and fancy Egyptian home decor accents from the once great ancient civilization. Our amazing Egyptian statues of impressive height and colors will draw the entire attention of the room. 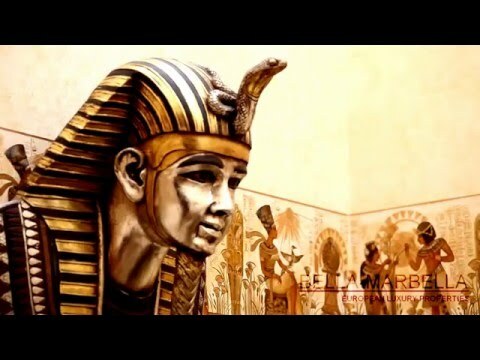 Pharaohs, cats, ankhs and sphinx statues for sale combined with ancient Egyptian style furniture and decor will create extravagant interiors ideal for Egyptian themed parties, Baby shower gatherings and Ancient Egypt enthusiasts. Whether your search for Egyptian columns, chairs or tables, do not hesitate to contact us for a quotation of a complete interior package of Egyptian furniture and decor. If you do not find a particular item, we will design it for you.